If you live in New York City or visit New York City, you need this book. 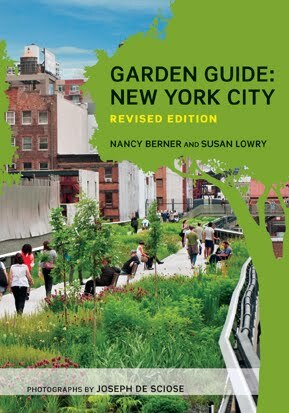 It will help you find engaging, interesting, beautiful, novel, important, or hidden gardens in the five boroughs. The authors Nancy Berner & Susan Lowry describe details of design and history with a dollop of NYC political wrangling, that will help you enjoy each space to the fullest. The writing is far more than the didactic prose of a typical tour guide. It's worth sitting down and reading this small book even if you have no immediate plans to visit a garden. I bought the first edition right after it was published in 2002, to help prepare me for living in New York. The first GardenGuide:New York City offered up the hidden gems and unknown garden riches of the city as well as describing the best features of the major botanic gardens. Since then, ten important new gardens have been added as well as smaller ones. There are also must-see features in existing gardens, like the new award-winning Visitor center in the Queens Botanic Garden, with its greenroof design. Photographer Joseph De Sciose has captured images of the gardens that opened my eyes to what's happening, and allowed me to view gardens I thought I knew in a whole different way. 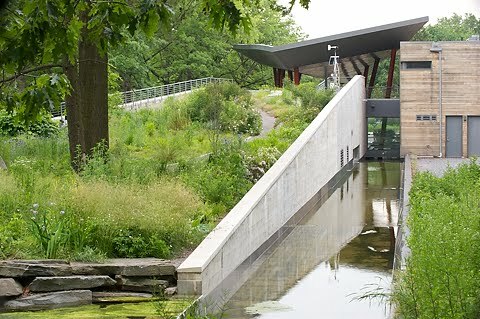 How could I have missed this water canal when I went to the QBG? I'll have to go back and look. 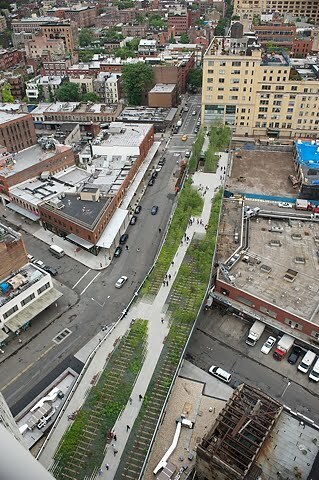 I especially love the many images shot from on high, like this of The High Line, that fabulous new(ish) restoration project in Chelsea. I knew the tracks of the old railroad bed were still there but the pattern of the ties stands out in a way that doesn't happen when they're right at my feet. Now when I visit, I'll have a mental picture of both views. 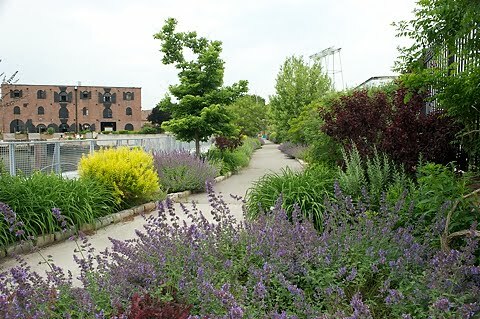 that in Red Hook you can visit two waterfront gardens and a Community Farm and picnic in this industrial area while viewing New York Harbor. My only quibble with this valuable book is the cut- size. The original publishers decided to serve up a 4" X 6" book, that could be slipped into pocket or purse and carried along. The second edition maintains that size. I want the font bigger and the photos MUCH bigger so I can fully enjoy this book at home as the delightful record of the NYC gardens that it is, then plan my outing for the day without increasing the weight of my backpack. Garden Guide: New York City, revised ed. by Nancy Berner & Susan Lowry, photos by Joseph De Sciose, W.W. Norton & C0 2010. Loved meeting Joe at GWA and this is a great peek of the book, which is a great peek into NYC gardens. Thanks! One of my favorite New York blogs is called 66 Square Feet and writes about hidden gardens like these. They visit Red Hook quite often and also write about gardening in New York. I'll have to pick up this book.